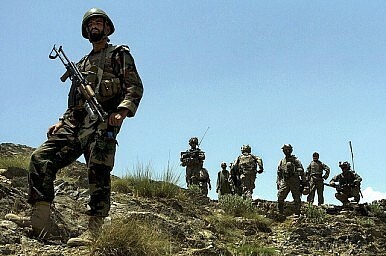 U.S.-led forces in Afghanistan won’t be able to kill their way to victory. But they may be able to choke off the insurgency. Ali Mohamed has a surprise for his U.S. Army advisers. An explosive one. It’s right here in his backpack. It’s late January in Marzak, a remote town in this rugged, sparsely-populated province in Afghanistan's extreme east, along the border with Pakistan. Mohamed is the newly-minted platoon leader for Marzak’s first and only Afghan Local Police force, a militia-style security outfit trained by U.S. troops and paid and equipped by the Afghan Interior Ministry. No, Mohamed isn’t one of the approximately 45 Afghan police, soldiers and airmen who have turned on their U.S. trainers over the years, killing 70 Americans. Rather, he’s an important ally in a critical Afghan village at an important late stage of the Afghanistan war. In many ways, Mohamed represents Afghanistan’s future as the U.S.-led NATO International Security Assistance Force (ISAF) eyes the exit after 10 years of bloody fighting. The Army’s 172nd Infantry Brigade has identified Marzak as a vital node in a Taliban supply route through Paktika’s mountain passes. For several years now, U.S. forces deployed to Paktika have concentrated on identifying and shutting down Taliban footpaths. Marzak is the key to controlling this particular path. In early January, an American platoon flew into the impoverished, agricultural village and began the hard work of recruiting and training a 100-strong local police unit from the local military-age, male population. The first 40 of the new militiamen completed their training on January 23. The Americans tapped the quiet, diminutive Mohamed to lead them. And just a few days later, Mohamed, acting on a tip from one of his neighbors, goes stalking off into the snow-coated mountains, unannounced, to dig up a Taliban weapons cache containing a 105-millimeter artillery shell (likely meant as bomb component) and more than 100 rounds of 12.7-millimeter machine-gun ammunition. Mohamed hauls the weapons back to Marzak and proudly presents them to his American trainers. They pat him on the back and gently recommend that, maybe next time, he should inform his chain of command of what he’s up to. All the same, U.S. Army Sgt. 1st Class Andrew Flynn is proud. “This is a new beginning for Marzak,” he says. But in Afghanistan, it’s a bit late for new beginnings. Indeed, Mohamed is a human manifestation of the coalition’s end-game. As a local cop interdicting Taliban weaponry, he represents the U.S. and ISAF’s last-ditch efforts to stabilize Afghanistan ahead of the planned departure of foreign troops. Today, some 124 months after the first contingent of U.S. Marines riding in CH-53E heavy lift helicopters infiltrated the Taliban stronghold of Kandahar in southern Afghanistan, the American-led international intervention in Afghanistan has an expiration date. “Hopefully, by the mid to latter part of 2013, we’ll be able to make a transition from a combat role to a training, advise and assist role,” Defense Secretary Leon Panetta said during a visit with European military leaders in Brussels. President Barack Obama had previously pledged to withdraw all regular U.S. combat troops – currently 90,000 strong – from Afghanistan no later than the end of 2014. At least 20,000 Americans will quit the country by the end of 2012, the Pentagon says. Some Special Forces are slated to remain behind as advisers, potentially for years. But they might number only a few thousand. Without U.S. combat forces and, just as importantly, America’s logistical expertise, the roughly 40 other ISAF nations, together providing some 60,000 troops, can’t hope to continue fighting – nor is there any indication they want to. France and Germany, two of the biggest force-providers outside the U.S., are already beginning their pull-outs.